FACE OF AUSTRALIA Self Tanning Bronzers, offer a natural looking, golden tan all year round without exposure to harmful UV rays. Instantly tans upon application without streaking, suitable for all skin types and has a light fragrance. 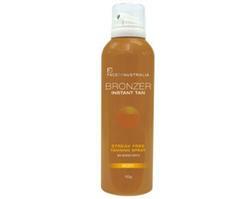 Available in bronzing mousse, gel and spray to suit any application. For best results exfoliate skin using a body scrub or loofah and ensure skin is completely dry before applying. Apply liberally and evenly, blend lightly over the skin until all of the Bronzer is absorbed, paying attention to knee's, ankles and elbows. Wash hands immediately after use. Allow Bronzer to dry before dressing. Colour will appear instantly and will deepen within 2 to 3 hours, lasting for several days. Wait at least 3 hours before bathing, showering or exercising. Repeat application for a deeper tan. Avoid contact with fabric until dry, particularly light fabrics.